© 1964 NEMS Enterprises Ltd. 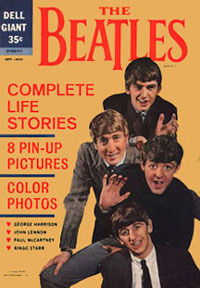 Shown are both variations of The Beatles Complete Life Stories issue # 1 (Dell Giant), published by Dell Comics September, 1964. This is the rarest and hardest to find of all Beatles comics. Upper grade copies are scarce. The special "made for export" version was recently discovered - the only difference is the price conversion, listed as "2/6". It is one of only a few known copies that have turned up.